Religious belief and practice have played an essential role in creating and challenging personal identity and societal norms since the dawn of human history. The study of religion is therefore a constituting element of humanistic inquiry. The Religion Department pursues that inquiry through the critical interpretation of religious traditions, offering courses by scholars trained in Buddhism and the traditions of East Asia, Hebrew Bible and the Ancient Near East, New Testament and Earliest Christianity, Judaism, Catholic and Protestant Christianity, and Islam. Students may also study of religions of Africa, South America, and South Asia in cognate programs and departments. The Religion Department’s courses employ a wide range of critical methods for interpreting these traditions including historical, literary, social, comparative, and cultural studies as well as moral and metaphysical reflection. The intellectual breadth and depth of Religion Studies has helped to prepare our graduates for many careers including business, law, medicine, public service, and teaching as well as ministry. Substantial knowledge of one of the great religious traditions or a central theme in two or more traditions. Close reading and interpretation of sacred texts and religious writings, including their specialized rhetoric, forms, and contexts. Significant mastery of critical methods used in contemporary scholarship on religion. PLEASE COMPLETE THIS ONLINE APPLICATION FORM WITH A DESKTOP OR LAPTOP AND SUBMIT IT WITH SUPPORTING DOCUMENTS BY APRIL 30, 2019 AT 11:59PM. Provide this form to your reference for your letter of recommendation. 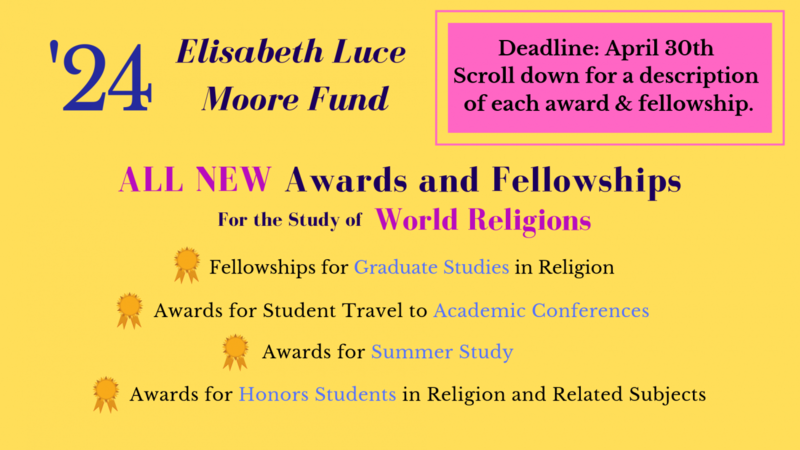 The Elisabeth Luce Moore ’24 Fellowships and Awards in Religion Studies offer financial support to Wellesley undergraduates and alumnae for a range of academic activities including graduate studies, summer study, honors thesis research, and travel to scholarly conferences. Specific information and application forms for each of these four competitions are to be found below on this website. 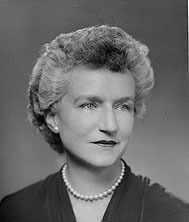 Mrs. Moore (1903-2002) was a daughter of China missionaries and a sister of Henry Luce, the influential internationalist and publisher of Time and Life magazines. At Wellesley, she majored in the Department of Biblical History and Literature, now the Department of Religion. A loyal and generous supporter of the College, in 1988 she established the Elisabeth Luce Moore ’24 Fund for the Study of World Religions, income from which maintains these grants. The Department of Religion offers annually a maximum of two non-renewable Elisabeth Luce Moore ‘24 Fellowship for Graduate Studies in Religion in the amount of $3500 each. All Wellesley College seniors and alumnae are eligible to apply. Applicants must be accepted to a degree-granting graduate program in religious studies at an accredited university or seminary at the time of their application. Applications must include: 1) a description of the program which they will be attending and their reasons for attending it (500-750 words); 2) a copy of their letter of acceptance to the program; 3) an unofficial Wellesley College transcript; and 4) a budget of how the award money will be spent and a list of other funding sources available or sought. At the completion of the Fellowship period, recipients must submit a report of their Advanced Studies experience to the Chair of the Department. The Department of Religion offers awards of up to $5,000 for students planning to attend accredited academic programs in or related to the study of religion held in the summer months. These programs can, for example, involve language study (with preference given to the study of languages not offered at Wellesley) or courses related to specific fields, topics or skills. To qualify for these stipends, students must demonstrate the relevance of their chosen programs to the study of religion or to topics that intersect with religion. This award may not be held concurrently with other College funding for summer study. Applications must include: 1) a proposal (500-750 words) describing how their summer academic plans will aid their research in the Study of Religion; 2) a budget of how the award money will be spent; 3) one letter of recommendation from a faculty advisor or faculty member familiar with the student’s academic interests and plans; and 4) an unofficial Wellesley transcript. Awards are conditional on acceptance into the proposed program. Recipients must submit a report after completion of the program. The Department of Religion offers awards of up to $3,000 for research, travel, or both, for students working on an honors thesis in or related to the study of religion. Preference is given to majors in Religion, although this award is open to students in all majors. This award may not be held concurrently with other College funding for honors thesis research. Students should apply to the Chair of the Religion Department by April 30 for summer research or October 8 for fall research. Applications must include: 1) a proposal (500-750 words) describing how their travel plans will aid their thesis research; 2) a budget of how the award money will be spent; 3) a letter of recommendation from their thesis advisor; and 4) an unofficial Wellesley transcript. After completion of the research travel, students must submit a report of their research activities to the Chair of the Religion Department. The Religion Department offers stipends to juniors and seniors for travel to and registration for academic conferences. To qualify for these stipends, students must demonstrate the relevance of the academic conference to the study of religion or topics that intersect with religion. Preference will be given to Religion majors and minors, although this award is open to students in all majors. There are two application dates: April 30 and October 15. Applications must include: 1) a proposal (500-750 words) that explains how the conference will contribute to their academic study of religion; 2) a budget of how the award money will be spent; and 3) a letter of recommendation from a Wellesley faculty member. To apply for any these programs in Spring 2019, candidates should submit their materials by April 30 at 12:59pm. Please use this online application form and provide this form to your reference for your letter of recommendation.